Nothing is more inviting than warm scones, fresh from the oven. Serve them for breakfast, coffeetime, teatime, anytime spread with butter, preserves, lemon curd and, if desired Devon, clotted or whipped cream. Garvey’s organic scones are one of life's simple pleasures. 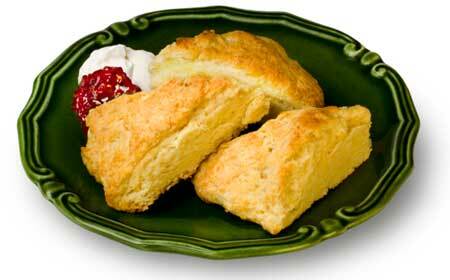 Our organic scones are made quickly and easily. “Following extensive research in Scotland, where scones originated, we returned to the US to develop the perfect scone mix – Garvey’s Best of Britain Traditional Organic Scone Mix. From it you will easily make authentic, delicious scones”. The ingredient list for Garvey’s organic scone mix is short, has no preservatives, no artificial colors, no trans-fats, no cholesterol, no eggs, and does not contain any unpronounceable words. Empty mix into a medium bowl. With a pastry blender, fork, or fingertips, work in margarine or butter until about pea size. If desired, add variations ingredients. Stir in milk with a wooden spoon, finishing with hand, until ingredients hold together, forming a soft dough. Bake 14 to 16 minutes – until golden brown. Transfer scones to a wire rack to cool, or serve warm. Blueberry: 2 tablespoons 1 oz. (28g) granulated sugar, 1/3 cup 2 oz. (57g) fresh or frozen blueberries, unthawed or 1/3 cup 2 oz. (57g) dried blueberries. Cheese:1 cup 3 oz. (85g) loosely packed grated Cheddar Cheese. Fruited: 1/3 cup 2 oz. (57g) currants, raisins, or sultanas. Ginger: 1/3 cup 1 oz. (57g) chopped candied ginger. Lemon or Orange: 2 Tablespoons 1 oz. (28g) granulated sugar and ½ teaspoon grated lemon or orange zest.